One of the rooms belonging to Winning Poker Network – Americas Cardroom – will be one of the first to introduce Short Deck Holdem tables! We all have heard about Short Deck Holdem. Game which, for some time now has been promoted by players connected with Triton High Roller Series, appears in more and more casinos all over the world. 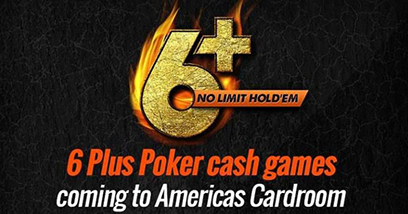 Short Deck Holdem is also known as Six Plus Holdem and Six Plus Poker and this is how Americas Cardroom will be calling it. Those of you who have not heard about it, should take a look at the rules. As the name suggests we play according to Texas Holdem rules, but there are some modifications. First of all we don't use deuces, threes, fours and fives. Aces can be used both as low and high cards, so A6789 is a straight just like TJKQA. Cash games only so far ! Six Plus Hold'em will be offered at a few limits. Americas Cardroom currently is testing the game on private tables. Games are to be finally available in 6-max, 9-max and heads-up format. So far we don't know if there will be tournaments, but it's very likely. Short Deck Holdem was first made famous a few years back when Phil Ivey and Tom Dwan shot a video promoting it. It was well-known in Asia due to lots of action loved by rich businessmen. Thanks to Triton Series Short Deck also came to Europe, and now it heads to Las Vegas. Such a tournament will be for instance played as a part of Poker Masters, and Aria casino already offers SD cash games (even Omaha Short Deck). Short Deck is also present on online poker rooms. Two years ago it was introduced by iPoker. Recently we have also heard about a new format that PokerStars is planning to implement (currently they offer Unfold Poker). It seems Americas Cardroom wants to be faster than their gigantic competitor. By registering an account at Americas Cardroom you get a 100% bonus worth up to $1,000. You can also get 27% rakeback, and this is just a part of the special offer. More about AC can be found here.